By the way, did you know that at the Belgian seaside shops are open on Sundays as well? And this is not all, there are more advantages to shopping at the Coast: there is a lot on offer with the sea always close by, so it’s really just about having a great time, also outside the shops, of course, because your body will need some sustenance too. 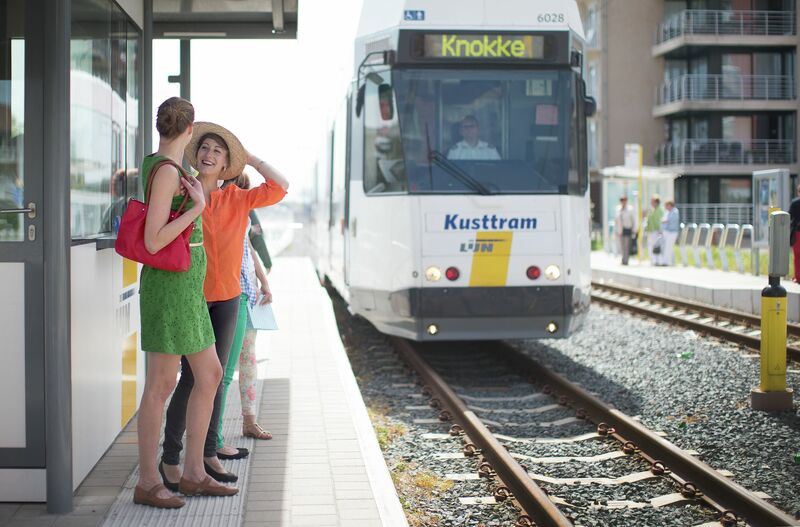 When you have reached the end of your wonderful day, you won’t face any problems with traffic jams or parking either, because you can just get on the next Coastal Tram... perhaps to the next shopping street!? Knokke-Heist is the decided fashion Walhalla of the Belgian seaside, with a long list of top labels and not-so-exclusive brands for those on a budget. Oostende, on the other hand, is the shopping city for all seasons with many streets offering hours of guaranteed browsing fun and small as well as bigger shops in the Adolf Buylstraat, Christinastraat, Kapellestraat, the Leopold II-laan and Van Iseghemlaan. You won’t be disturbed by the noise of traffic, because the busiest shopping streets are pedestrianised! And what if it’s raining or cold? No problem, because there is always the shopping centre at the Wapenplein to escape to. Nieuwpoort is a newcomer in the world of fashion, but the Albert I-laan offers a nice mix of trendy shops and the Havenpromenade also has some great places to excite any fashionista! Of course Knokke-Heist, Oostende and Nieuwpoort are not the only fashion hotspots, there are some in other seaside towns too: the Zeelaan in De Panne, for example, and the Zeelaan (yes, that’s right, there is more than one) in Koksijde-Oostduinkerke. The Leopoldlaan in Middelkerke has been given a make-over and was turned into a pedestrian zone, while Westende-Bad not far away, Bredene, De Haan and Blankenberge all have great things to offer for a nice shopping day out! Will you come for a browse too? Shopping is one nice thing to do at the Belgian seaside, but there is so much more to nexperience at the Coast. So we have put together a list full of wonderful tips for an unforgettable weekend by the sea. Feel like a drink in the open air? Whether you’ve sat yourself down on a terrace in the centre of De Haan, Koksijde or Het Zoute, or have secured yourself a spot on one of the many beach terraces, you’ll thoroughly enjoy your time in the wonderful sunshine with an immense ice cream or a nice shrimp croquette. The Belgian Coast Greeters are dying to take you on a tour of all their favourite spots, letting you discover the Belgian Coast’s loveliest places and hidden gems, far away from all your typical tourist hotspots. Tours are free and will make you feel like a real local, though please keep in mind that Greeters can only take 6 people maximum. For more info and reservations, go to www.belgiancoastgreeters.com. Feel like walking, cycling or just some action? If you want to get active on your holiday, then definitely try the Kustwandelroute, a network of surfaced road and non-surfaced paths that stretches from De Panne to Koksijde and passes some lovely seaside towns. You can walk on the beach, in dunes and meadowland. There is even a special, free app that will guide you along the network and show you everything there is to do! Or would you rather prefer a bike ride? That’s fine too, because for cycling fanatics there is a special cycling network as well, though you can of course just go for a ride along the seafront. Have no bike? No problem, just rent one! Feel like a trip with a pedal car? Pedal cars always make for lots of fun. You can go it alone, with the pair of you or just as well take the whole family, why not?! There are many places offering them for rent, so you’re sure to find exactly the one you’re looking for. If you’re going to the seaside for a weekend, you will need somewhere to sleep of course. Hotel, B&B, apartment or holiday home, the possibilities are as endless as the sea itself! And booking is easily done online, so what are you waiting for? Michelin is not the only restaurant guide that finds the Belgian Coast delicious, because Gault Millau thinks so too, with nearly one restaurant in every coastal community. Bon appétit! With lots of discounts and other benefits at more than 40 attractions, the Coast Pass is your ultimate partner in crime at the Belgian seaside. Download it here for free for the whole family!